Work is under way on a five-mile wire mesh security fence around Gleneagles Hotel where the G8 summit will take place in July. The cordon will be made up of about 10,000 panels aimed at preventing unauthorised access to the Perthshire hotel and its grounds. Group 4 Securicor will provide a security presence until Tayside Police take overall control. The hotel will operate as normal while the fence is being built. 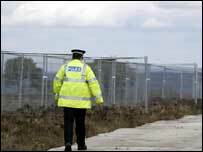 Tayside assistant chief constable Willie Bald said: "The fence is one element of the security measures being put in place at the venue for the G8 summit. "It clearly outlines the secure boundary lines which will be policed and where powers of arrest can be used if anyone attempts to get through the fencing." CCTV systems will be put in place around the cordon and police patrols will be stepped up as the work continues in the run-up to the 6-8 July summit. Police said the fence did not create any significant environmental impact and the force had been working with Scottish Natural Heritage. The Scottish National Party MSP for Perth, Roseanna Cunningham, said the fence represented the barrier between the G8 leaders and the ordinary people who they govern. "As the fence begins to go up, we are now going to see in tangible reality what the G8 is going to mean to the area," she said. "This ugly steel structure, of course, will have an unfortunate symbolism in that while the G8 leaders are, presumably, discussing matters related to international development, there is a huge barrier between them and ordinary people." Was the G8 a success? World leaders have a deal, but does it deliver? Profile: What is the G8?